Due to the interest of my post The Other 21st Skills, I decided to individually discuss each of the skills or dispositions I proposed that are in addition to the seven survival skills as identified by Tony Wagner. This post focuses on vision for the future. 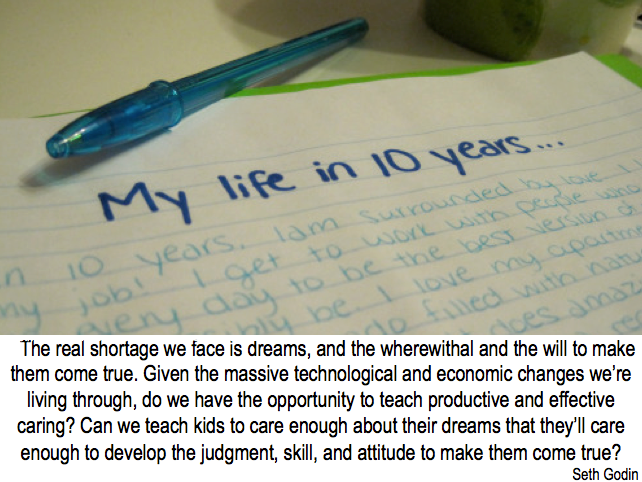 Having a vision for the future is an natural extension of Hope and Optimism, another 21st century skill I proposed. A vision for the future enhances hope and optimism. 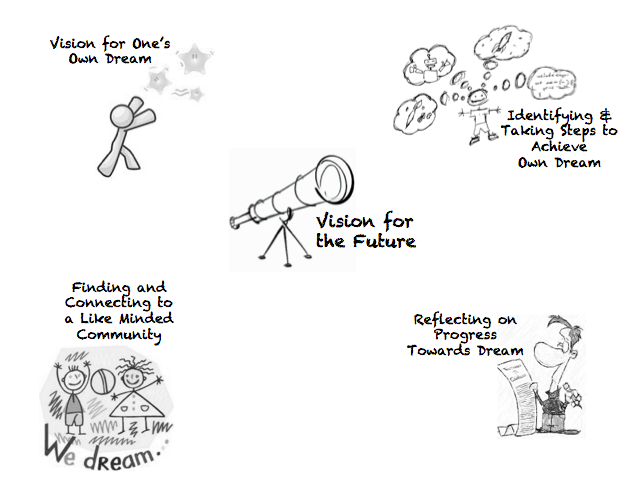 To clarify, having a vision for the future is identifying and taking steps toward fulfilling one’s dream. It goes beyond and is qualitatively different than identifying what one wants to be when one grows up or thinking about college. It is about dreams. Vision for one’s own dream. Identifying and taking steps to achieve one’s dream. Finding and connecting with a like minded community. Reflecting on progress towards achieving one’s dream. An extension of this activity might be asking learners to create a vision board (see Vision Boards for Kids and Visions & Values for Kids). Technology could be used for this process by giving students the opportunity to create a Glog or an Animoto of images that symbolizes their dreams. As a parting shot about young people and their dreams, here is a short film by high school student, Sam Fathallah. The asked his classmates to write their dreams out on a transparent whiteboard.
. . . and for those who just want some additional inspiration, Randy Pausch Last Lecture: Achieving Your Childhood Dreams . . . It seems the issue goes deeper than just learning to care about dreams. At the core, what isn’t being addressed is the idea that each and every student’s dreams are worth caring about. There isn’t enough focus on self-development and on building social psychological constructs such as self-worth and self-esteem. Without these building blocks, there is no foundation for developing traits essential to pursuing dreams and reaching them successfully. Reblogged this on What Else? 1DR.